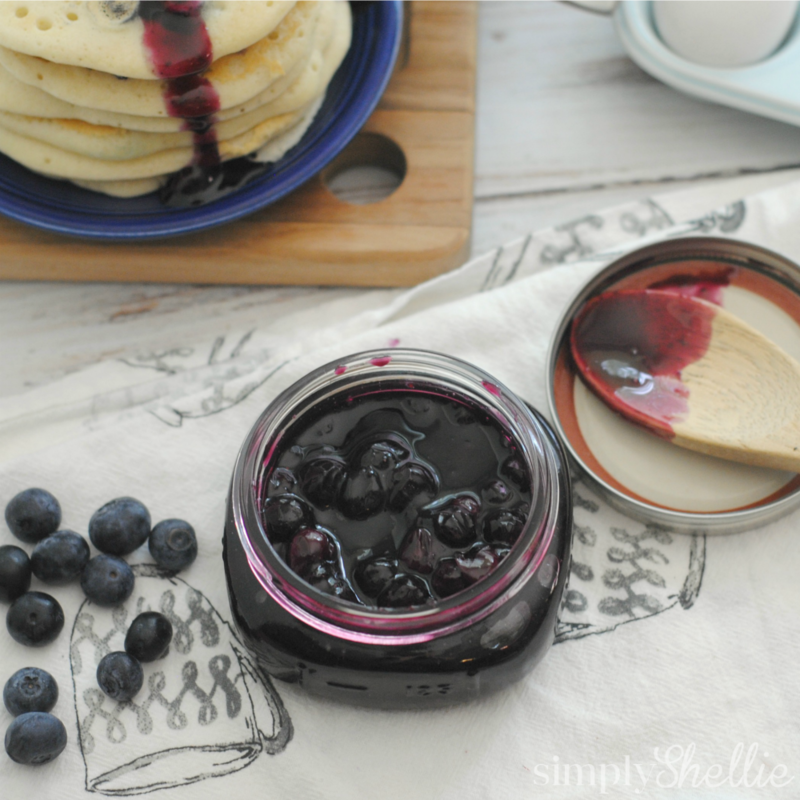 Homemade Blueberry Syrup is simple to make and oh-so-yummy. It’s the perfect topping for buttermilk pancakes! Also try it in yogurt and on ice cream! It’s blueberry season! Don’t you just love when berries are plentiful? 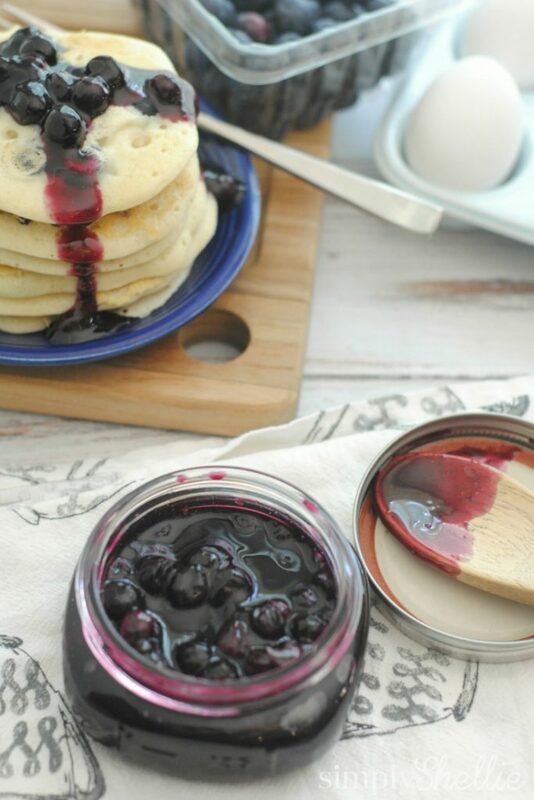 If you stumble across an awesome blueberry sale and can’t manage to eat them all in time, I have a great recipe for Homemade Blueberry Syrup you can make. 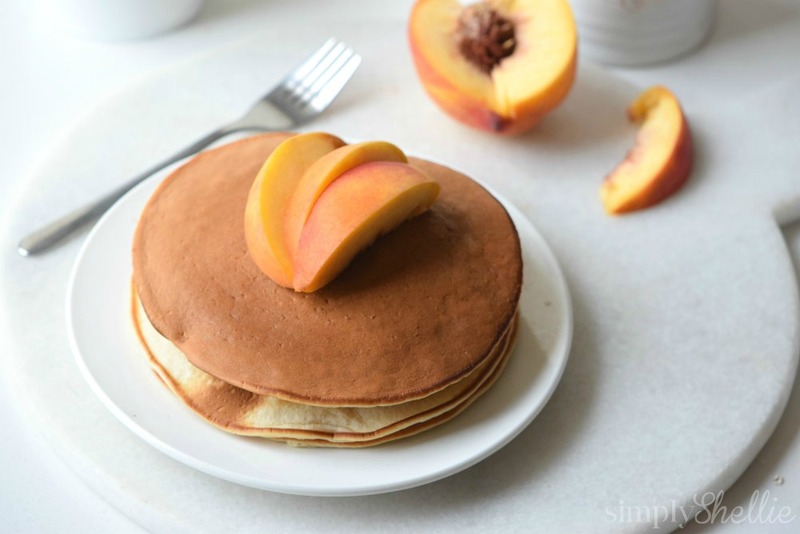 This is perfect for pancakes and waffles and is even great to drizzle on top of ice cream! I also like to add it to plain Greek yogurt. You can also make a big batch and pour them in smaller jars and gift them. Blueberry syrup is a fun little gift idea. You could give it alone or put it in a basket with some homemade pancake mix. I use the smallest of the Ball jars (4oz) and put a little blue gingham fabric square over the top and tie with ribbon. Combine all the ingredients in a medium size saucepan and simmer on low/medium heat for 15-20 minutes. Pour into an airtight container (mason jars work great) and store in the fridge up 1 week. The longer you cook, the more the blueberries will melt down. If you prefer chunkier syrup, remove from heat around 15 minutes. If you prefer to cook your blueberries down more, simply cook for a longer period of time. I mentioned this above in the recipe section but I also wanted to note that you can make this recipe as chunky or syrupy as you’d like. I personally prefer a few chunks of blueberry in mine so I don’t cook it down quite as long, usually around 15 minutes. If you prefer a true syrup then cook yours longer. More like 20 or even 25 minutes. Just make sure you watch it so it doesn’t burn. I think this Homemade Blueberry Syrup goes perfectly with my Greek Yogurt Pancakes. If you haven’t made them yet, whip up a batch and pour some Homemade Blueberry Syrup on top. Seriously good!